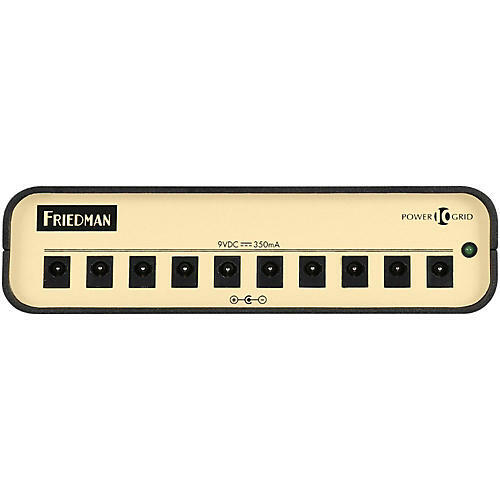 The Friedman Power Grid 10 was designed to address all of the deficiencies Dave encountered with power supplies from other brands over his 27-year history of designing and building pedal boards for the biggest touring guitarists and studio producers. The Power Grid 10 was designed to meet the demands of any player who wants a dead-quiet pedal board, that can be taken anywhere and is tour-ready. -1 x 2.1mm black connector to 1/8-in. phono black connector - 20-in. long - right angle connector on 2.1mm connector. -1 x 18 V cable - 2.1mm black connector with additional 2.1mm slave connector on one side to 2.1mm black connector - regular polarity - 20-in. long - right angle connector on both sides. Dimensions: 4.5 x 6.75 x 1.75 in.